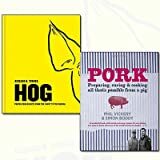 Pork Recipes Collection Pork and Hog 2 Books Bundle includes Titles in this Collection :- Pork: Preparing, Curing and Cooking All That’s Possible from a Pig,Hog: Proper pork recipes from the snout to the squeak. Description:- Pork: Preparing, Curing and Cooking All That’s Possible from a Pig This celebration of all that is great about pork showcases its fantastic versatility. Chapters cover Shoulder & Ribs, Belly, Loin & Fillet, Ham, Bacon, Sausages and Oddbits (offal), and cover the recipes and techniques needed to make everything from Dry-cured Ham, Chorizo and Salami to Smoked Pig Cheek Pancetta and Black Pudding Fritters. The 100 international recipes hail from the USA, Spain, Italy, Germany, Hungary, France and India, among others, and explore the cooking and preserving of pork around the globe. The book also covers the rearing of pigs, including their feed regimes, day-to-day care and the best diets to produce flavoursome meat. Essential reading for pork lovers everywhere. Hog: Proper pork recipes from the snout to the squeak Hog is a celebration of all things pig – from breeds and rearing, to butchering and preparing, with techniques, features and more than 150 recipes for nose to tail eating. The comprehensive range of dishes includes hams, bacon, sausages, charcuterie, pates, confits, roasts, grills, hotpots, ragouts, pies, casseroles, scratchings, crackling, trotters and much more – with a foreword from Josh Ozersky and guest contributions from a range of British, American and International chefs and cooks including Diana Henry, Meredith Erickson, Judy Joo, Valentine Warner, Neil Rankin, Mitch Tonks, Fergus Henderson and Aaron Franklin.